Some of my more volatile colleagues have come close to seizure with this weekend’s issue of The Economist, whose cover carries a waspish map of ‘Skintland’ and whose densely packed articles include a record three that discuss Scotland. Having been a long-time reader of the paper, I was not among those going ballistic—having used The Economist as a lodestar of news down the years, I regard it as an old friend. Starting in Munich in the 1970s, I could no longer access any UK—let alone Scottish—media. Eloquent though it is on German issues, the Süddeutsche Zeitung covered neither exciting election in 1974 and drove me, faut de mieux, to try what I had always dismissed as a stuffy, humourless specialist weekly, although I had never read it. I was genuinely stunned to find how wrong I had been. I found it witty, insightful, numerate, well written, global in outlook and, best of all for me, disinterested in sport, celebrity or gossip. With its weekly schedule, I found it just the tool to stay abreast of news that mattered so that, when I moved to California, it continued to provide my weekly dose of penetrating analysis—in sharp contrast to the lightweight and parochial West Coast press in the shape of the San Francisco Chronicle, Sacramento Bee, San Jose Mercury or the Oakland Tribune. So, for the last 40 years, I have been a fan, almost an addict needing my weekly fix of concise, informed opinion—so much so that, with my return to Scotland coinciding with that sad decline of the once-noble Scotsman into Mail-in-a-Kilt, The Economist continued as my current affairs source-of-choice. When news of this week’s issue (and the outrage it was causing) reached me before the print edition did, I was simply curious. Nonetheless, seeing the cover that triggered the stramash and reading the related lead article did give some sense of outrage; my first instinct was to draw an equivalent map of various English shortcomings. Then, I thought better of it. Are we Scots still so touchy that a well executed lampoon and demolition job need trigger apoplectic fits? Is the fact that The Economist is now trying to deconstruct Scottish Independence not a definitive sign that debate has arrived, that a hitherto fore oblivious nomenklatura is waking up? Independence has arrived at the gates of the establishment. The language—implying unrest and coded revolution—is not the most measured phrasing I have seen on those pages. But it reflects how many unionists see it. The trouble is, it is also how Franco saw it and who, in his four decades of odious fascism, tried to repress both Catalan identity and their language. They have reason to be stroppy in a way Scots can’t quite justify. For the repression that Scots may feel is more the result of a combination of genuine lack of appreciation for our differences in Britain, hand-in-glove with a congenital assumption on the part of most English that their culture represents the sine qua non of civilisation. The subsequent conflation of England with Britain and all that is good in either then becomes Pavlovian and, from there, axiomatic support for the unionist argument. What we Scots don’t quite ‘get’ is that all is often done more with affection than malice. This may be the first time that usually impeccable editorial standards of The Economist have run foul of this. Few nationalists would quibble with this positive slant—and yet it has received little covereage. 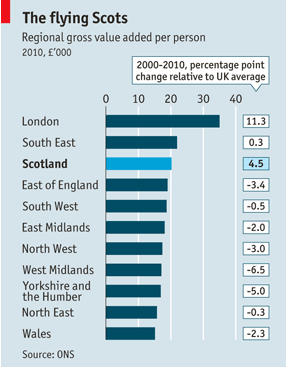 This article includes a chart (see below) that highlights Scotland as the third best-performing ‘region’ (yes…I know…) in Britain, after London and the SouthEast. Note that, not only does Scotland rate above anywhere outside the Southeast of England but that it beats all but London in terms of growth. And when some of the more negative caveats in both articles are examined closely, they smack more of an attempt to find counter-arguments than the balanced analysis I would normally expect. As an example, statements made that Scotland would depend on oil for 18% of its GDP and that an oil price of $60 per barrel would seriously reduce production are both factually correct. But would either invalidate Scotland’s economy when Venezuela and Nigeria, let alone the Gulf states are far more dependent on oil and Brent crude, while dipping below $100 only once in the last year, is trading at over $120—twice the ‘worst case’ above? The article further cites how salmon exports boomed on the back of Chile losing business and how said malt whisky distillers never faltered in the recession and broke through £4bn in exports this year. It’s the same in The Economist as elsewhere. The British (= English) establishment, based in London and steeped in colonial history and a reticence that Johnny Foreigner has anything to teach them, is ill-disposed that any other (let alone an equally viable/successful) culture could exist within these islands. They—and their mouthpieces among which The Economist must count itself—can be expected to articulate a broadly unionist line more often than not. It’s our rôle as Scots not to be so touchy or easily provoked when our cousins lose either their objectivity or their famous sang-froid as they appear to have here. Be gracious: they’re not used to contemplating serious competition from another ‘region’ in what they continue to see as their own back yard. Excellent piece Mr. Berry, from a fellow East Lothianite! I must confess to having followed through on a similar instinct to yours and produced a tongue-in-cheek equivalent UK map … but the articles themselves definitely weren’t so bad. The graphic though – the source data is the ONS regional GVA figures at http://www.ons.gov.uk/ons/publications/re-reference-tables.html?edition=tcm%3A77-250308 – is not actually all that relevant to the article. Some might even say that the numbers are misleading, The article spends a lot of time on oil. But oil & gas are not included as part of any region on that graphic as those are “extra regio” items so far as ONS GVA figures are concerned. How to Lie with Statistics?